EOL began as a muse titled ‘Hospice’. The title was chosen to pay respect to those remarkable care-givers. 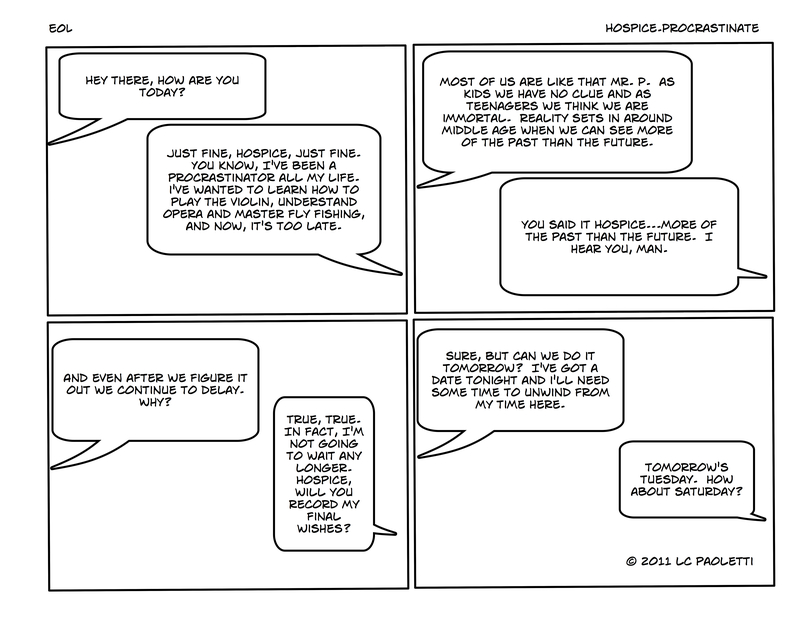 However, the more I read about our final phase of life, the more I realized that EOL extends much longer than that usually ascribed to hospice care – which ranges but is typically available to someone with 3 months or less to live – so I changed the strip to EOL. It’s probably safe to say that the population can be divided into two groups. One group gets things done on time and sometimes ahead of schedule while the other group procrastinates as long as possible. Although most of us fall into one group or the other, many of us delay discussions and actions relating to EOL. ‘Procrastinate’ shows that one can be a life-time procrastinator, even when time is obviously very short. This entry was posted in General, Hospice and tagged hospice, procrastinate, teenagers, time. Bookmark the permalink. Love it! I’m just like Hospice and Mr. P. I actually touch on the subject of procrastination in my blog, as well, if you’d like to read and respond.